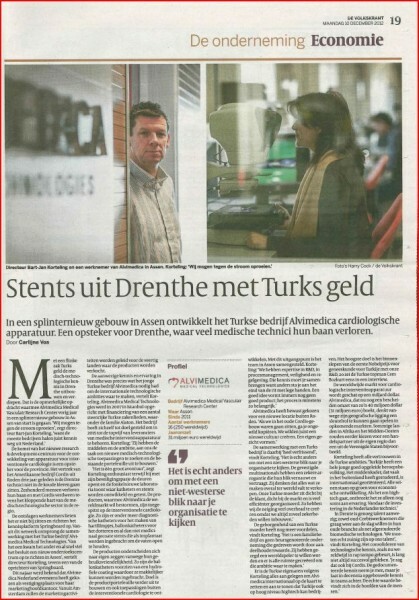 Alvimedica, market leader in medical stents and catheters in its home country, Turkey, opened a marketing office in Amsterdam in the fourth quarter of 2012 as a springboard to the European market. 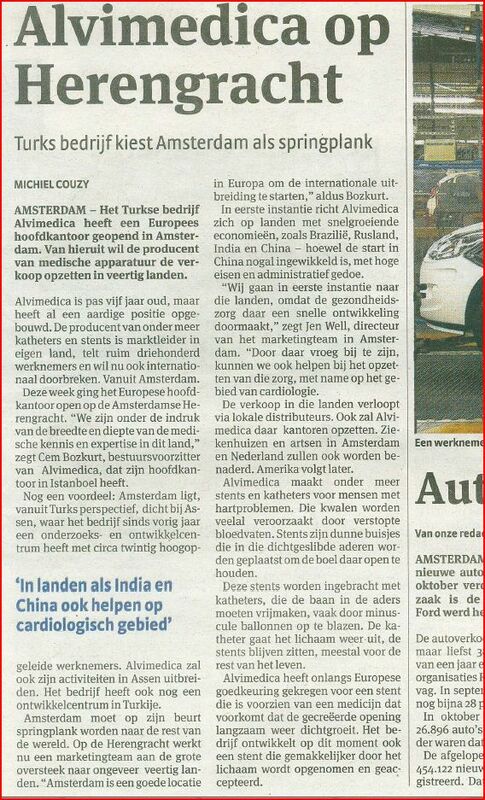 A year ago Alvimedica set up an R&D centre in the Dutch city of Assen. The company wanted to raise its brand profile and asked Media Wise for help. Media Wise helped Alvimedica to identify its strengths and potentially winning news angles with which to hit the news headlines. Media Wise created storylines via Dutch and English press releases that were distributed to the relevant national and international media channels and a select group of journalists who would potentially be interested in covering the Alvimedica story in greater depth. These journalists, most of whom cover the business of medicine and healthcare, received follow-up calls. Our efforts led to a full-page article in the Dutch national newspaper De Volkskrant and an article on the economic news pages of Het Parool. Both articles were very positive in tone. In addition, the head of R&D in Assen was interviewed on the business news radio station BNR. The interview lasted a whole 15 minutes and covered in breadth the company’s entry into the Dutch and European markets. The public relations effort proved to be a subtle and above all an economic way to raise brand awareness. To buy the same level of advertising exposure on these channels would have cost EUR 76,500. Experts estimate that the real benefit of editorial exposure is at least three times the advertising equivalent cost.